And I just started painting....candy corn of course! I painted her name but you could do about anything... Boo...Trick or Treat... endless! 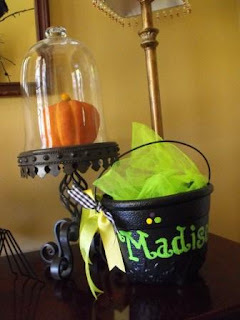 I think I will make one for each child in her class..
Maybe one for her dance teacher too! Just sitting out with the rest of your decorations! Oh Susie...CUTE, CUTE, CUTE!!!! Those plaques and the bucket are fabulous!! Did you just freehand her name or use some kind of template? Cause it just looks perfect! What about one for your best friend's girls???? How precious is that! Too cute. As I always say...you amaze me! Check out my new pics of M & A on my blog! M is such a natural! Have a wonderful day sweetie! I may have missed it but are you coming to the Canton MS flea market this year? Mom and I go every fall and I was hoping to find you there next Thursday. How perfectly adorable! I wish I could paint. I can see lots of ways to use this and what a great gift! You are quite talented!!! So cute, I could do that but I don't have any little ones to give to! Sob, sob! Absolutely darling. You have been a busy girl! Susie this is so cute! I'm off today and on my way to get a few things now I'll have to add this to my list for my nieces. 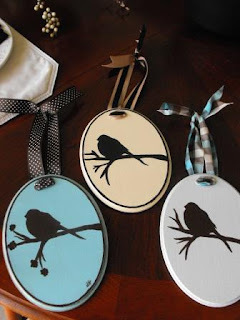 Great Idea also love your cute little birdies. How lucky are the kids in her class! That is so cute! that is WAY cute! I really have to go get me some paint so I can paint those picture mats. My mom is a good painter freehand. I am not so much. Really need to get my Halloween stuff out, still have just fall going on here. Ooo, I'd better run out & find me a bucket. I'm sure my daughter would love it. Very cute - thanks for the idea. You are so talented! 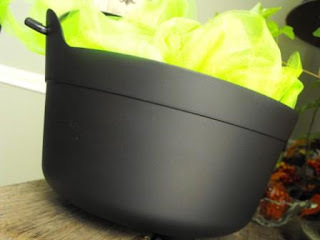 I have one of those ugly plastic cauldrons I've used in the girl's classrooms and then I chuck it in storage because it's blecky. Wow! What a transformation you made! I'm going to have to try my hand at making mine adorable! Every child in the class?! You go girl!! I love the birds you painted. What are the circles? It almost looks like paint can lids. Very cute. That is so cute great idea I love the colors! Oh these are just adorable Susie! 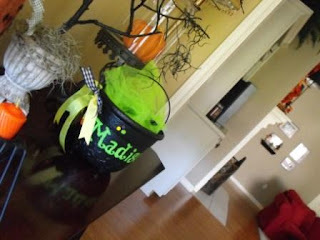 I have one of those buckets and I will do my last name on it...even got lots of the paint you showed. Thanks for sharing your creations again. I just love coming over here. Have a good day! 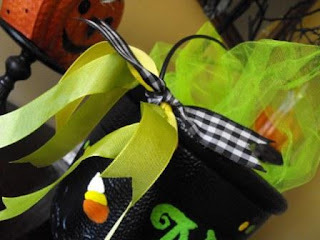 your bucket turned out so super cute! 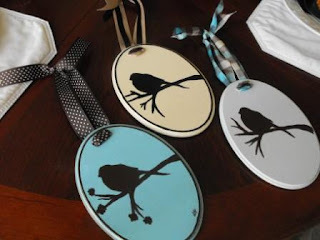 and i am LOVING the new little bird plaques! how did you do those? did you have a stencil? i may need to buy one from you.... happy thursday! That is so cute! I love it. Those birds you painted are so cute too! You are really talented! Both are adorable. LOVE the bucket! Simply adorable! Do you want the names of my kids too? 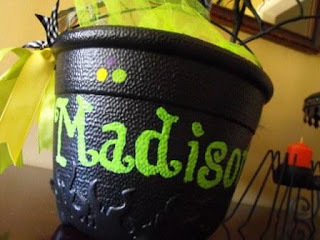 I'm sure Madison will look super cute carrying this for trick-or -treat! You are so creative! I see those buckets and just skadiddle on past them, but I see how they have NEW life! THESE ARE ADORABLE!!! 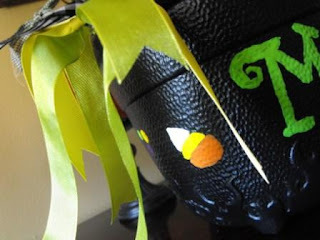 If only I could paint....I don't even think I could make the candy corn look like it is supposed do...I may try though. You are so talented! What a nice mom you are! Very good idea, thanks! I'm going to get those today!! VERY VERY cute! 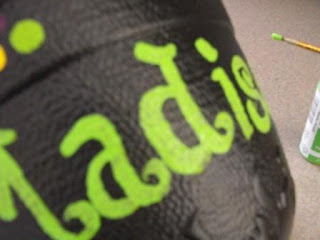 I LOVE the green on the black! The ribbon and fluff make it even BETTER! Adorable! That post sums up my life. I see something cute and spend 500 hours making one for everyone I know (or who's willing to take it). These are just the cutest. I will need to make a couple for my friend's lil' ones! OOOOOO! So adorable! Do you just freehand the name? Sooooo cute! 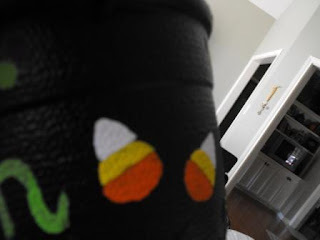 Not many people like candy corn...It's my favorite...nothin' says Halloween like Candy Corn. 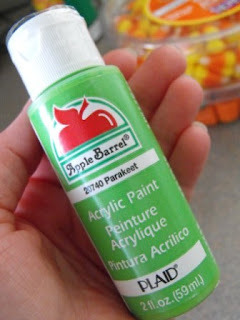 It taste great with Apples too...they should make some kind of Candy Corn Apple...maybe they do??? My kids still watch Noggin and I can't wait for them to start singing the "I don't like Candy Corn" song...do you remember that? 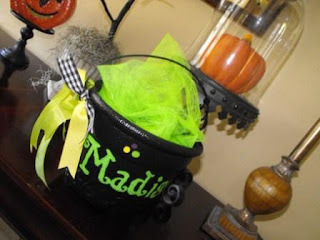 Susie, I meant to mention earlier how much I like the cauldron bucket. I actually picked up one at a thrift store the other day and put it back because I couldn't think of anything cute to do with it. And no, I won't be selling at Canton, I'll be shopping. We (mom and I) always have a great time. I hope to see you there though. Oh wow! Those little plaques are so cute. Love them! And your daughter's bucket is adorable. What a great idea! I definitely think I will be copying this one! They could even be painted to match their costume for the year! Love it! Oh no, are those crown plaques I see in your sidebar? Are you trying to make me go broke or something? What a cute bucket! You have talent to spare, girl! ;o) Tell me about those bird plaques...I'm intrigued! I'd like an orange one...thanks! Love it, what great skill you have, did you just freehand draw to write her name or use a stencil of some kind. Love it! Brilliant idea! I will have to check out my big lots and do the same thing for my daughters preschool class! Thanks for sharing. Love this! 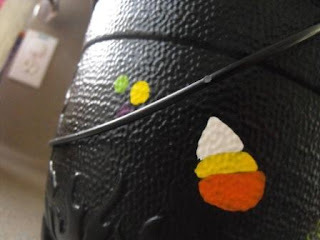 I may even be able to pull off a candy corn or two even though I have no painting abilities. The ribbon just adds that special touch. Adorable. LOVE IT!!! So cute! You are such a talented gal. Very cute! I do agree the smooth ones look better. But wowee--what a treasure even bumpy! Seriously, where do you get all of your ideas from?? I really envy of you just creat something out of nothing! These are very cute! Love the hanging tags. I want one too, please adopt me!!!A-DOR-A-BLE! Just found you while over at Mimi Sue's cottage. I love all your crafts! You have a wonderful blog! 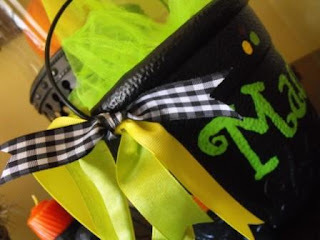 What a great idea...that would make a perfect party favor! I don't know where I've been...I love, love, love the plaques!! And that bucket, well I'm gonna rip off your idea for sure!! I was just thinking what my little princess would put all her Halloween loot in. Thanks Susie!! Lovin' the birdies! Wouldn't those look great on a Christmas tree? You are so talented, girl! What a cute idea, too! Madison will be the best looking trick-or-treater around! 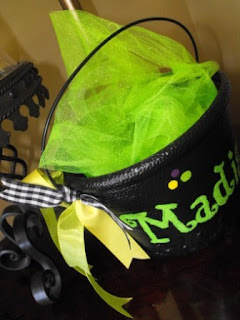 Ok, I got my buckets from Big Lots...and now I need paint and ribbons...but what is that fancy green 'stuff' inside of the bucket? I am going to be busy, I am not very artsy and I have at least 12 of these to make, but I bought 15 just in case I want to make a couple for the teachers and then maybe one for our last name, cute idea!!! "you know I had to add ribbon"
I LOVE IT!!!!!!! I'm right there with ya! I love ribbon too! It's GREAT to be a Girl!! !